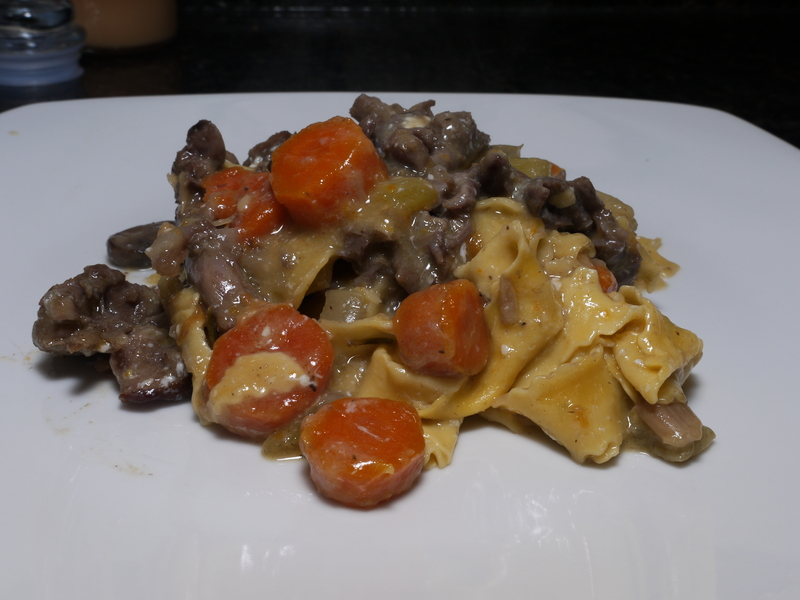 The Duck Confit I made was used to make this dish: Duck Ragu with Pappardelle. This is what I served on Thanksgiving rather than turkey. It was a nice change of pace from the Thanksgiving norm. The pulled duck and the ragu go great with the pappardelle to make a hearty dish that’s perfect for Fall and Winter. In a deep skillet, heat the oil over medium-high heat. Add the onion, carrot and celery and season with some salt and pepper. Cook, stirring, until slightly softened (about 2 minutes). Reduce heat to medium, and continue cooking and stirring until browned (about 8 minutes). 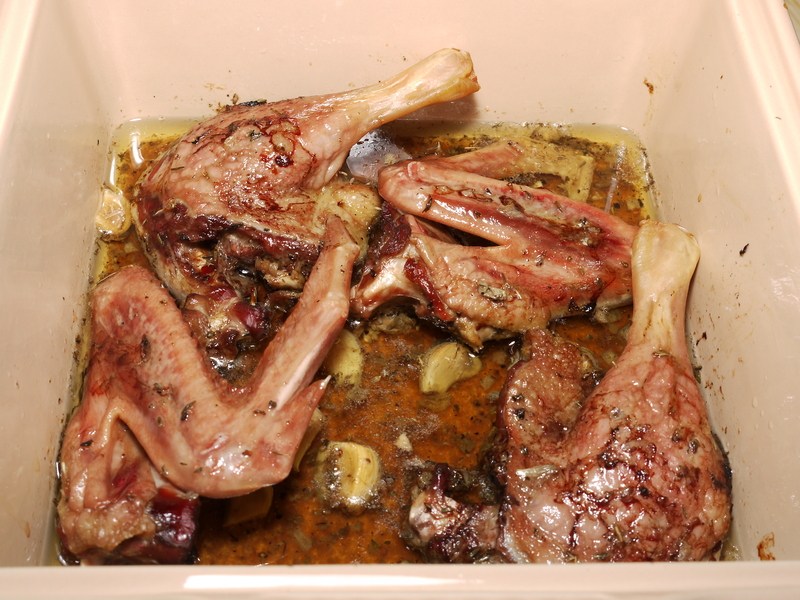 Add the rosemary and garlic and continue cooking until fragrant (about 1 minute). 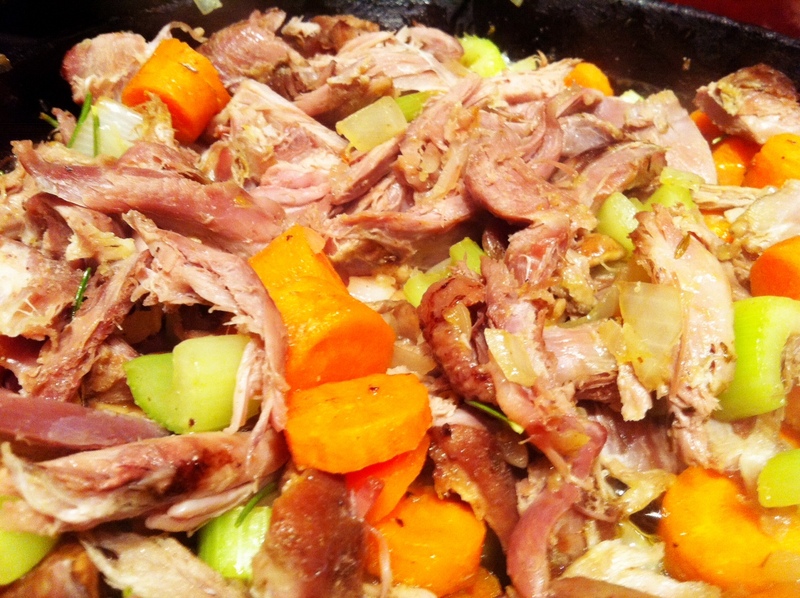 Add the duck meat and stir gently to coat with the vegetables. Add the wine and chicken stock and simmer until 3/4 cup of liquid remains (about 10-15 minutes). Remove from heat and stir in half of the butter. Cover and keep warm. In a large pot of water, cook the pappardelle until al dente, drain and drizzle with olive oil to prevent sticking. Add the pasta to the ragu and cook over medium heat, stirring gently, until simmering. Remove from the heat and stir in the mozzarella and remaining butter. Season with salt and pepper and serve. Pappardelle should be available in most supermarkets, but if it’s not, feel free to use a thick pasta of your choice. I would advise against using a thin pasta like angel hair or spaghetti. However, this dish is truly at its best when you use pappardelle. Feel free to add in other veggies or use another cheese if you so desire. This is a great holiday/cold-weather dish that makes a complete meal. Wink is an Austin restaurant that prides itself on using the freshest ingredients possible. When it comes to food, we all know fresh is best, but in today’s world of Sysco suppliers, freshness often doesn’t receive the attention it deserves. Thankfully, Wink succeeds in its main focus. Every plate we had was fresh and it’s no wonder Wink lists the farms and local produce suppliers it maintains a relationship with. We arrived a few minutes earlier for our reservation so it was no surprise our table wasn’t quite ready due to Wink’s intimate size. So we were forwarded over to Wink’s wine bar next door. There, we settled on a bottle of tempranillo we thoroughly enjoyed. While we waited, we perused the menu and decided to do the five-course tasting me. Side note: surprisingly, I’m a big fan of tasting menu. It goes against my control freak nature, but for some reason, I 100% trust chefs when it comes to putting together a tasting menu. First course was a Coriander-scented Himachi Sashimi in Chilled Citrus Soy Broth with Radishes and Pea Shoots. While it was pleasant, it wasn’t the best I’ve ever had. The broth didn’t really add much to the himachi so it was a little more subtle than I expected. And while I like subtle, this was too subtle. The citrus didn’t pop and the radishes conflicted with the himachi in my opinion. 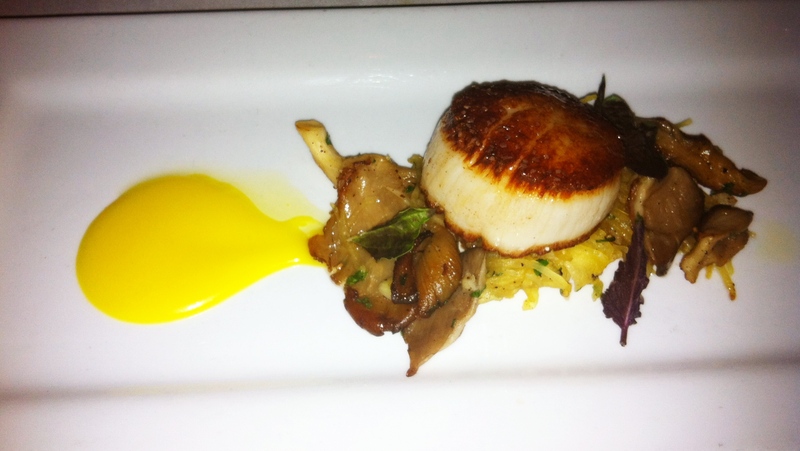 Second course was a Seared Dayboat Scallop with Spaghetti Squash, Oyster Mushrooms, Basil and Orange Emulsion. This turned out to be my favorite course of the night. The scallop was seared to perfection, the spaghetti squash tasted fresh and had a nice crunch to it, the oyster mushrooms were seasoned just right and the citrus element of the orange emulsion popped — unlike the himachi dish. Oddly enough, the orange emulsion reminded me of the icing that comes with Pilsbury’s Orange Danish Rolls. I mean that as a compliment, it was delicious when mixed with the saltiness of the other elements. 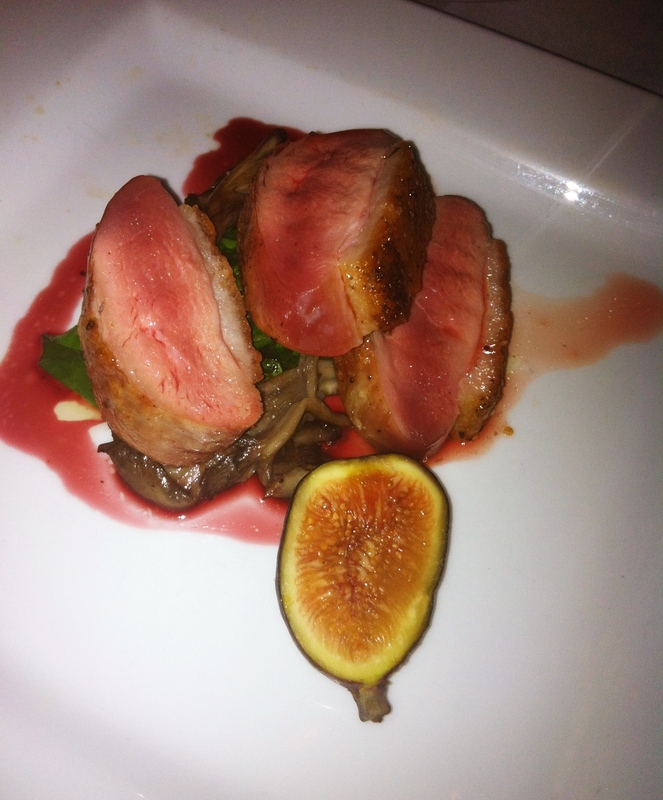 Next up was Duck Breast with Sweet Potato, Rainbow Chard, Maiitakes and Brown Fig. We ordered the duck medium rare (that’s how I usually roll) and it came out cooked perfectly. It had just enough juice to it and basically melted when chewed. The chard and the sweet potato added a nice sweet, earthy taste to the richness of the duck. The fig tasted good, but was a little lost among the other elements. Grilled N.Y. 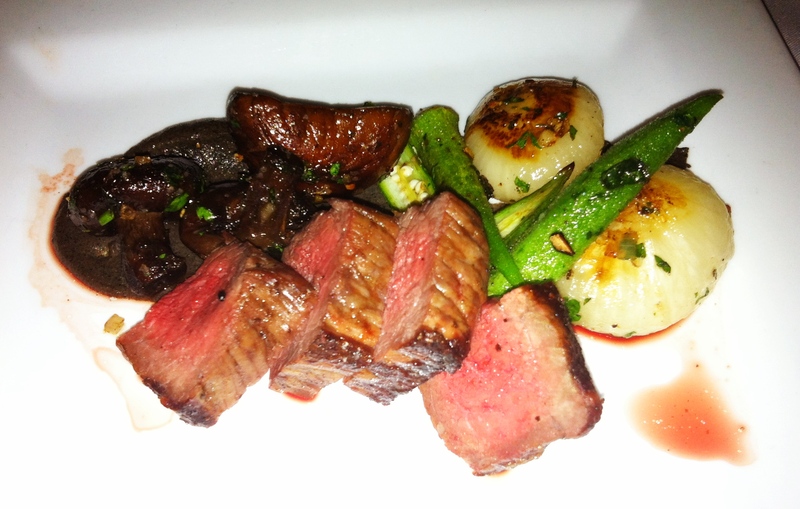 Strip with Creminis, Okra, Cippolini and Charred Eggplant Puree was the next course. Once again, we ordered the meat medium rare and once again, it had just enough sear and just enough juice. The creminis and cippolini were amazing when eaten with the strip as was the charred eggplant puree — perfectly smoky and earthy. Now for the okra, I don’t like okra and haven’t eaten it since I was about seven years old. I toughened up and tried it again though and Wink may have convinced me to reevaluate my loathing of okra. It was salty, smoky and had a nice crunch to it. For dessert, we split a cheese plate of some great Texas cheese and a dessert sampler. The dessert sample had three components: A Raspberry Meringue filled with Lemon Curd, Creme Brulee and El Rey Chocolate Cake. The Raspberry Meringue was hands down my favorite. The meringue had the perfect crunch to it and the lemon curd was more sour than sweet which was my favorite aspect. The creme brulee was bruleed wonderfully and it was a solid creme brulee. For some reason, creme brulee isn’t a dessert I get overly excited about, but there was nothing wrong with this one. The El Rey Chocolate Cake was super decadent. El Rey chocolate is from Venezuela and it was easy to realize the cocoa content was quite high. I’m not the biggest chocolate fan, so Miguel was on his own for this one and based on his feedback, it was a great chocolate cake. Overall, Wink has some creative dishes that really benefit from the freshness philosophy. Wink also takes wine very seriously which is something most fine diners can appreciate. The place is small so it is very intimate. Reservations are highly recommended, but don’t necessarily expect them to seat you promptly. We had a reservation for 8 p.m., but didn’t get seated until 8:30 p.m. Luckily, the wine bar is fantastic and makes you forget you’re waiting. Wink is also a little hard to find as it’s nestled in a an area off the main drag. It’s definitely worth the trip. Wink practices what it preaches when it comes to the main philosophy: fresh, fresh, fresh. Wink is located at 1014 N. Lamar Blvd. and is open Mon.-Sat. from 5 p.m. to 12 a.m.